The company places its trust in the latest 530 peristaltic pumps and tubing for the reliability that this delicate task requires. Further benefits delivered to Paradies Eis include low pump maintenance requirements, excellent processing capabilities, high levels of accuracy and easy operation. “We use only the finest raw materials in our ice creams, starting with milk and cream, right up to high-quality Italian pistachios and organic coatings,” states the company’s proprietor Axel Steen. For nearly 20 years, the founders and owners of Paradies Eis, together with 20 or so employees, have been producing almost one million litres of ice cream per year. There are over 50 varieties in the company’s range, from classics such as vanilla to exotic flavours like mango curry. “Varieties with our acclaimed chocolate sauce or a chocolate coating are especially popular at the moment,” explains Mr Steen. The chocolate has to be dosed at a temperature of around 60°C into the ice cream, where the liquid mass then hardens again. At Paradies Eis, peristaltic pumps are used for this task. And not without reason, as this type of pump delivers many advantages to food and beverage manufacturers. 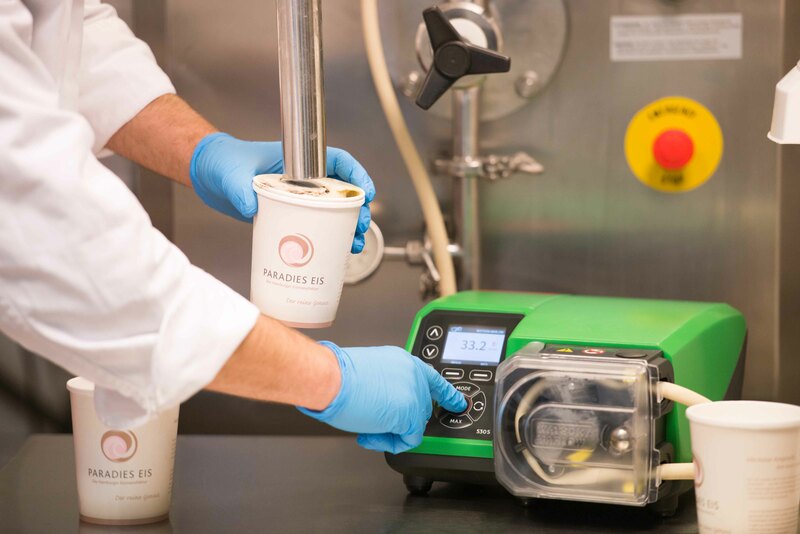 Without valves, seals or moving parts in the fluid path, peristaltic pumps are ideal for operation in hygienic environments; the pumped media only comes into contact with a food quality tube. Moreover, media is pumped very gently and with extremely low shear forces, so product quality is never compromised. Peristaltic pumps also offer high precision and reproducibility, which help maximise product consistency, an important consideration in ice cream manufacture. Further benefits include low maintenance requirements and rapid product changeovers. However, even within the peristaltic market there are significant differences between pumps, as Paradies Eis can confirm: “We were previously using a peristaltic pump from another manufacturer, which did not deliver the required precision on a consistent basis, and the insertion of the tube was complicated,” reports Mr Steen. The tube did not locate securely in the track, which meant that the operator often had to make adjustments. After just one year of use, pump reliability and precision declined even further, prompting the company to seek an alternative supplier. Depending on the recipe, the pump delivers up to 70 litres of chocolate sauce per hour. The 530 series pump is operated via an intuitive keypad with large buttons and a clear colour display for easy operation with gloved hands in a production environment. Compared with other peristaltic pumps, the 530 model scores highly with its ±0.5% accuracy and precise speed control range of 2200:1. What’s more, the 530 pump is self-priming and capable of dry running, while thanks to its robust and simple construction, can be easily operated by different personnel, including temporary workers. This is especially important in a sector such as ice cream, which can witness large seasonal spikes in demand during periods of warm weather, necessitating the employment of temporary workers. In order to ensure high reliability and maximum service life of the pump and tubing, it is important that both are perfectly matched. WMFTG is the only company to manufacture both peristaltic pumps and tubing in a number of materials. The Bioprene peristaltic pump tubing used at Paradies Eis, is USP Class VI and FDA regulation 21CFR 177:2600 for contact with aqueous food, at operating temperatures up to 80°C. The long peristaltic life means stoppages for a tube change are rare events and easily fitted in with general maintenance downtime at the ice cream manufacturing plant.